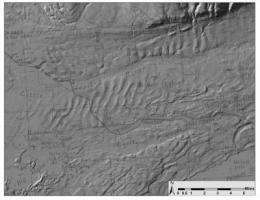 (PhysOrg.com) -- New research indicates that one of the largest fresh-water floods in Earth's history happened about 17,000 years ago and inundated a large area of Alaska that is now occupied in part by the city of Wasilla, widely known because of the 2008 presidential campaign. The philosophy of uniformitarianism takes another hit. The geological history of the Earth is 1 of catastrophies - with 1 massive catastrophy just thousands of yrs ago (Genesis 6-9). This massive f/w event is what creation scientists call a post-Flood event - like the channeled scablands of eastern WA. These really are exciting times to be a creation geologist. I recommend that you return to your normal pastimes of handling snakes and "speaking in tongues", as you clearly don't understand the content, significance, or even the chronology of events outlined in this article. Leave the science to scientists. Uniformatarianism was an overreaction to Catrastophism. The fact that catastrophic events have occurred in no way whatsoever makes the world six thousand or so years old. So I see you are back to the usual disinformation and mendacity to support your religion. If you have to engage in this sort of behavior to support your disproved beliefs perhaps even you should notice that you are trying to prop up a dead horse. I wonder if Sara P. was part of the detritis left behind ... some of her views seem to date from then. I was unable to suppress an outburst of laughter.